Over the past 11 years, United Way of Greater Los Angeles’ HomeWalk has mobilized more than 100,000 participants, raised $8.6M to invest in housing and homelessness solutions, and supported more than 19,000 individuals transitioning from homelessness into homes. But when it began, we never could have anticipated that it would become the largest public event to end homelessness in the nation. 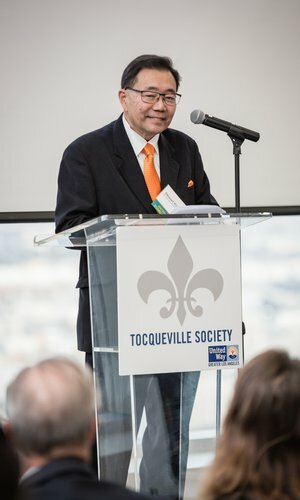 HomeWalk’s incredible success is the result of a collaborative effort between thousands of individuals over the years, but it’s beginning can be credited to one man: Stewart Kwoh, Founding Executive Director and President of Asian Americans Advancing Justice (Los Angeles) as well as a member of United Way of Greater Los Angeles’ Board of Directors. Back in 2007, Kwoh served on the board of both United Way of Greater Los Angeles and the Fannie Mae Foundation, the latter of which held a “Help The Homeless March” in Washington, D.C. as a demonstration against homelessness. He had the vision to realize the impact that a similar event would have on Los Angeles County. “I spoke to Elise Buik, a great leader who had just become the head of United Way in Los Angeles. She said YES,” explained Kwoh. “We created HomeWalk in response to the rapidly growing number of people on our streets and the lack of knowledge about the causes and solutions for homelessness in Los Angeles,” Kwoh said this week at a United Way milestone 10-year impact report launch. HomeWalk’s success that first year, and for the many years since, has been made possible with support from the community and key funding from many different organizations, including millions in matching funds from the Conrad N. Hilton Foundation. This year, United Way of Greater Los Angeles has also partnered with the Los Angeles Rams to engage even more L.A. County neighbors in the fight to end homelessness. This year’s goals are bold: engage 15,000 runners/walkers and raise $1.5M to support our people experiencing homelessness. We need to bring everyone in to end homelessness in L.A. County. Join us at HomeWalk on Saturday, May 18 in Downtown Los Angeles’ Grand Park. Register to run/walk and fundraise at www.homewalkla.org.